1. 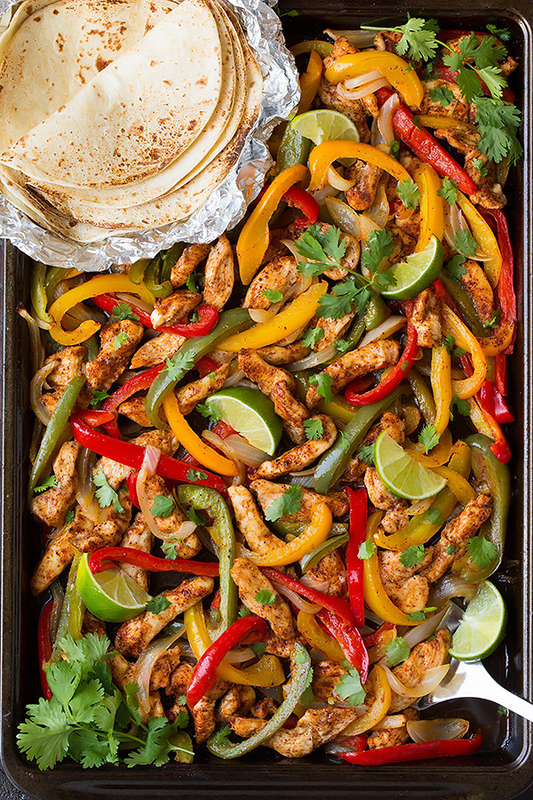 Chicken fajitas that don't need anything but tortillas + the ingredients that bake on the pan. 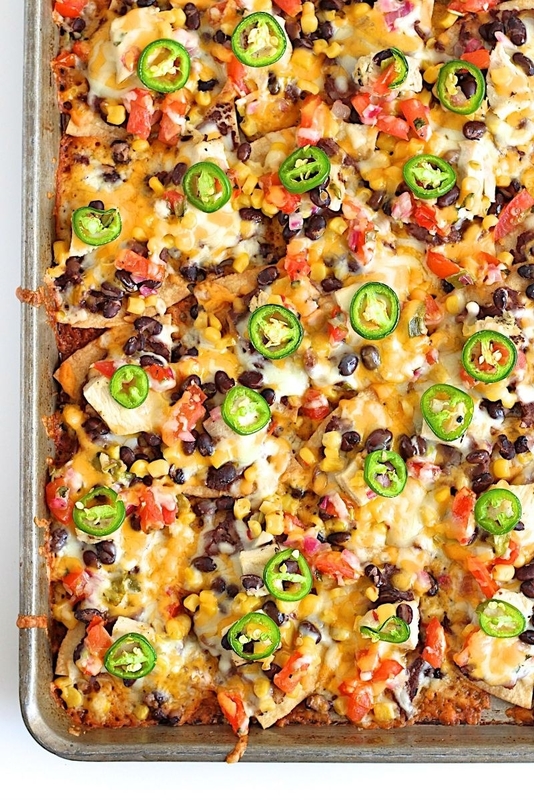 These are completely customizable, too — you can add whatever toppings or vegetables you want. 2. A pizza that you can divide evenly and let everyone top with their choice of meat and veggies. You can also use whatever sauce you'd like (BBQ, ranch dressing, creamy alfredo... the possibilities are endless) or no sauce at all. If you're looking for explicit instructions, though, the original topping combo, White Pizza with Salami and Peppers, is here for you. 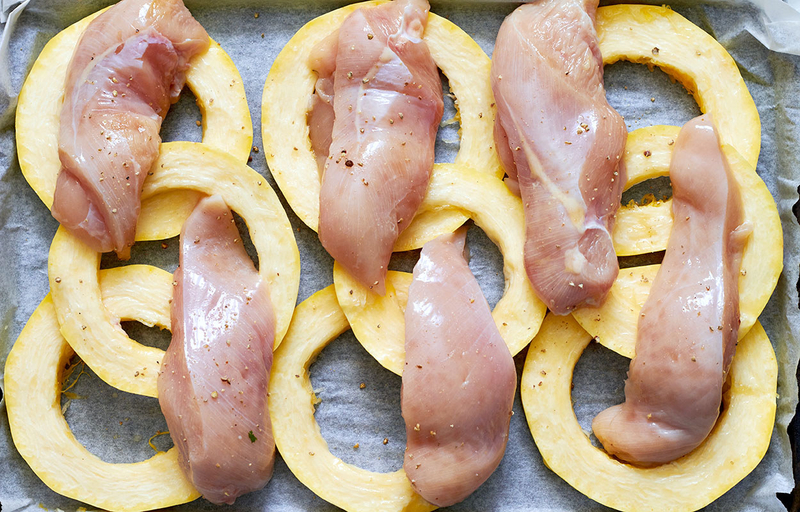 Get it on MyRecipes, from Southern Living. 3. 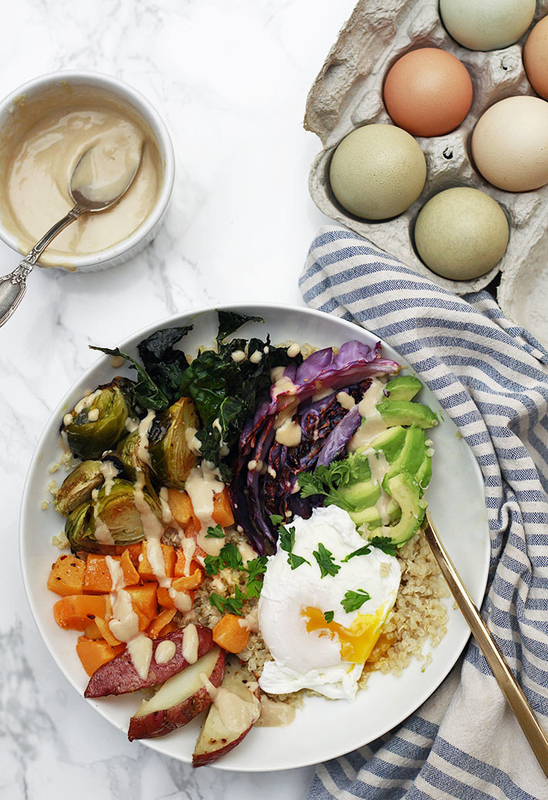 Vegetable-quinoa-tahini bowls that let you simultaneously taste the rainbow and clean out your fridge at the same time. In this recipe, you do have to cook the quinoa and poach the egg separately, but if you plan ahead you can do that in the last 15 minutes on your vegetable timer. Get the recipe from Yummy Mummy. 4. Sweet and Sour-ish Shrimp dressed in a simple 4-ingredient sauce. 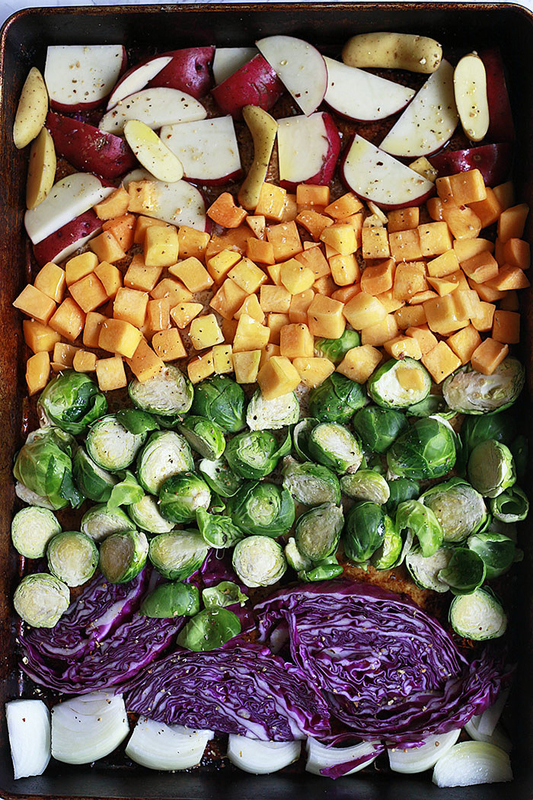 To make enough for four people you'll need two baking sheet's worth, but they can both go in the oven at the same time. Get the recipe on Grab a Plate. 5. 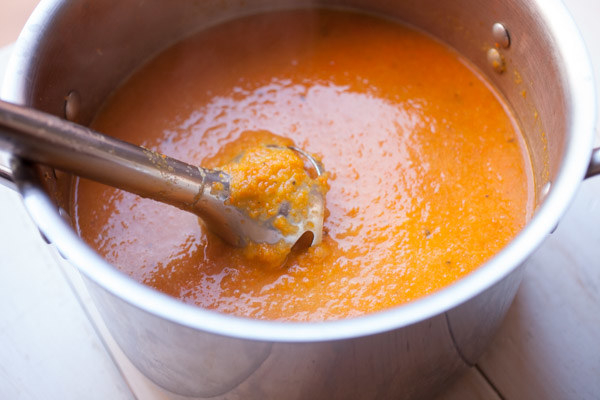 Immersion-blender carrot soup that strikes the perfect balance between oven-roasted flavor and true convenience. 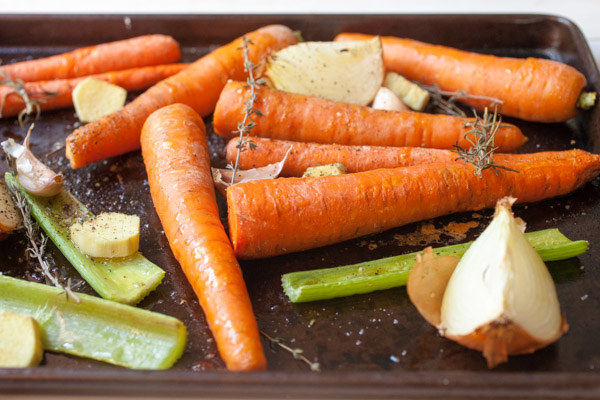 ☀️ Butternut Squash + Carrot (check out this recipe). To make any of these combos creamier, stir in a block of cream cheese just a few minutes before you pull it off the stove, so it melts into your mixture. Get the recipe for this Roasted Carrot Soup on Macheesemo. 6. Three-ingredient* pork chops that you don't have to remember to marinate ahead of time. *In case you couldn't tell from the pic, the vegetables are not counted in the 3-ingredient calculation here. Get the recipe on Simply Sissom. 7. Fresh salmon topped with pecans that toast as the vegetables roast. If you want to make this but worry about the price, salmon and pecans both freeze very well — so if the salmon goes on sale you can pick it up, freeze it, and wait to make this dinner until the pecans are also on sale. Get the recipe at Simple Healthy Kitchen. 8. Cauliflower that, with the help of mushrooms, croutons, and gruyére, feels like a fancy grilled cheese that you eat with a fork. Photograph by: Bryan Gardner. Courtesy of Martha Stewart Living. © 2016. Why call them cauliflower "steaks" when they're really a delicious dish by their own right? Just make sure to follow the directions, which call for two sheet pans, to avoid sad and mushy mushrooms. Get the recipe from Martha Stewart. 9. Buffalo chicken drizzled with a 20-second microwave sauce that's accompanied by whatever ranch-flavored vegetables you or your family prefer. I also have a hunch that you could use chicken wings in this recipe, too, although to get that crispy, caramelized texture, you might have to let them bake for at least 10 minutes longer. 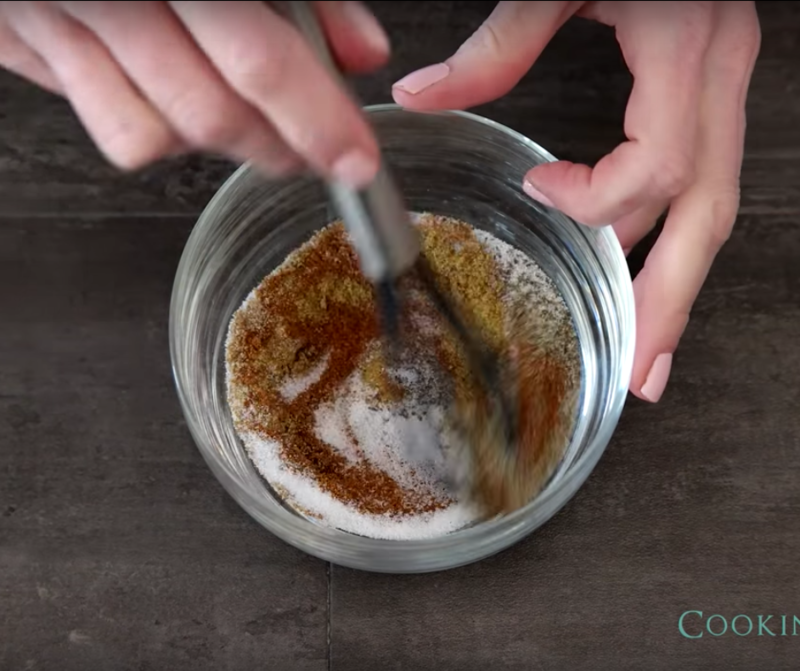 Get the recipe on Meg's Everyday Indulgence. 10. Bratwurst baked with hearty potatoes and onions that won’t leave a single tummy even the tiniest bit hungry. I would definitely serve this with brown mustard and sauerkraut. And I might pretend it's a fancy hot dog, if I had the right tasty bread on hand. 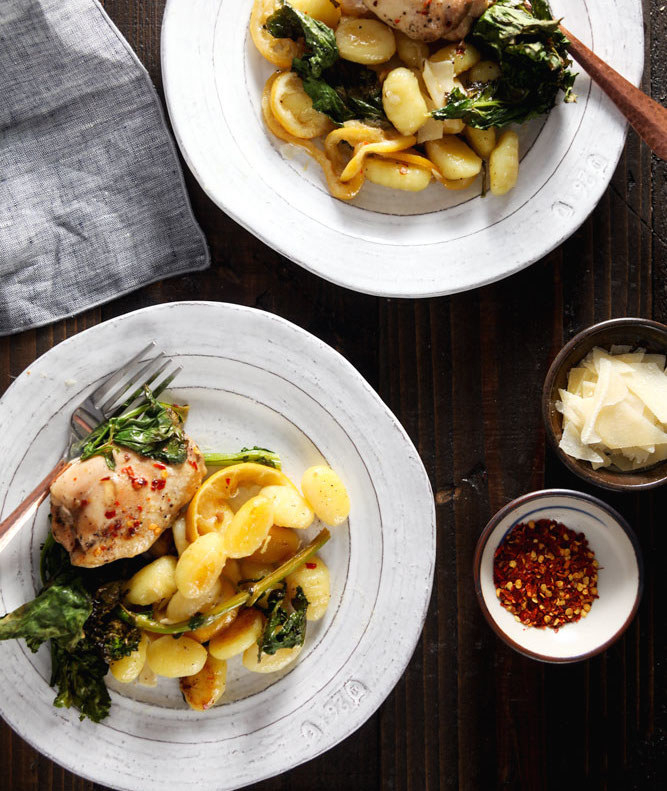 Get the recipe on Lisa's Dinnertime Dish. 11. An oven-fried chicken parm that gives you an excuse to play with your food. Breading the chicken will be messy, but it's by far the most involved part of this recipe. So once you're done with that, all you have to do is let it bake. Get the recipe on Rachel Cooks. 12. Gnocchi (!) 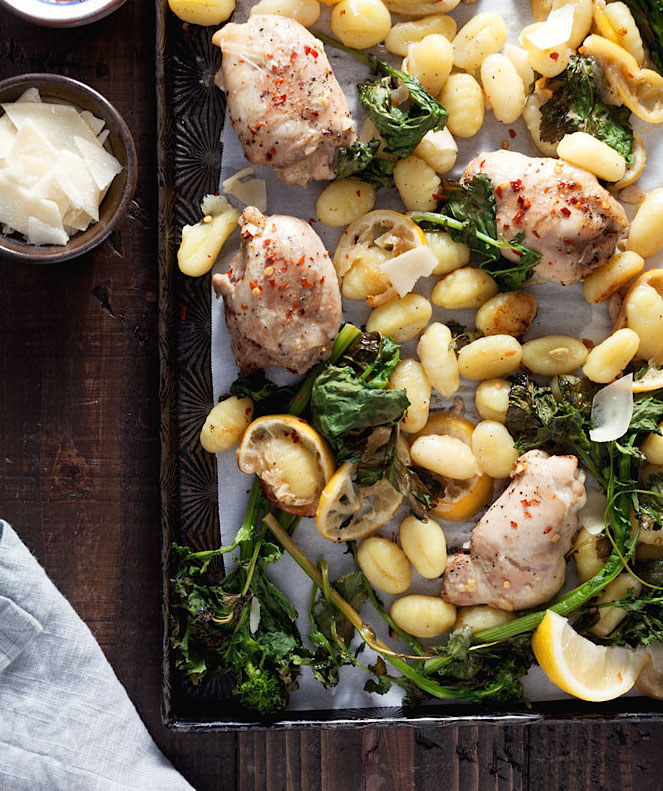 roasted with lemons, fresh greens, and chicken thighs. 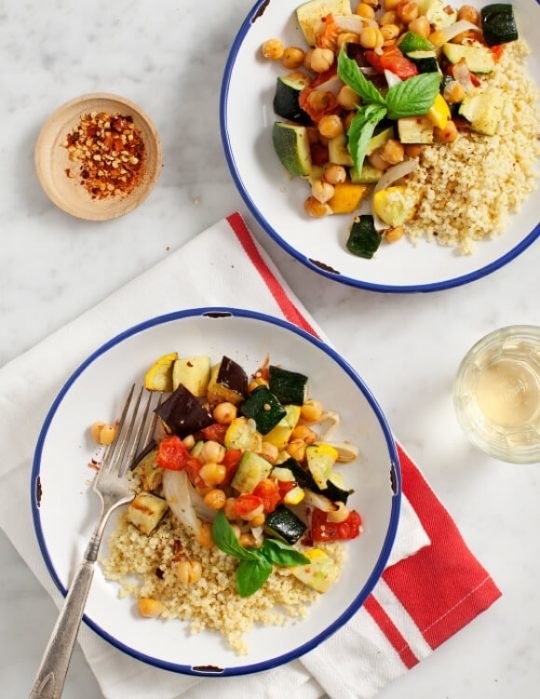 Get the recipe on Healthy and Delicious. 13. Salty-sweet-spicy tofu that you'll barely recognize after you pull its caramelized goodness out of the oven. If you're the meal-prep type, you could press the tofu and coat it in its marinade in the fridge for a night or two beforehand for extra potent flavor (you may need to press it again if it's very juicy when it's time to cook). Get the recipe on Delish Knowledge. 14. 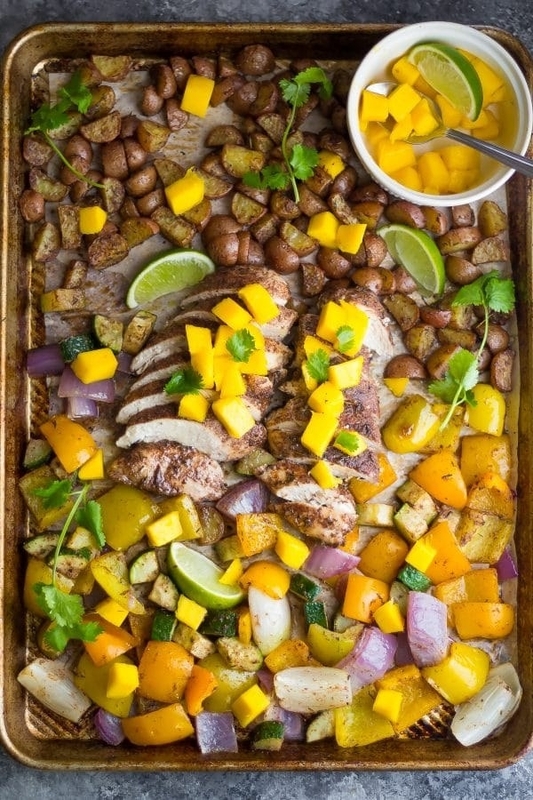 ~Thirty-Minute Thursday~ Jamaican Chicken and Vegetables that you toss with mango post-oven. 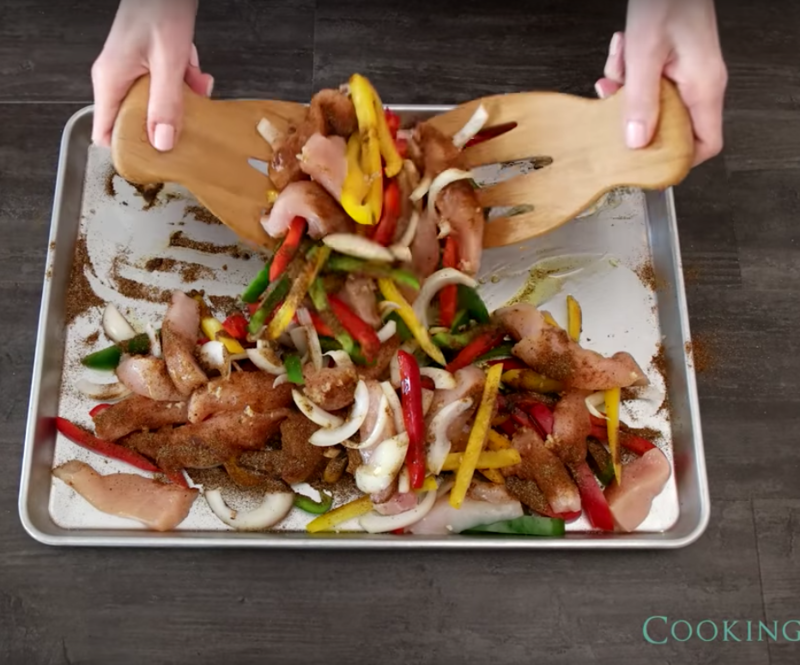 You can easily adjust the spiciness here — yes it does call for Jamaican jerk spice, but each person eating can have their own chicken breast with their personal, preferred level of seasoning. Get the recipe on Sweetpeas and Saffron. 15. Pierogies coated with Tabasco, chili powder, and garlic, then roasted alongside kielbasa sausage and your favorite vegetables. Of COURSE you should coat your pierogies in hot sauce, why have I never tried that before??? Get the recipe on Foodie with Family. 16. 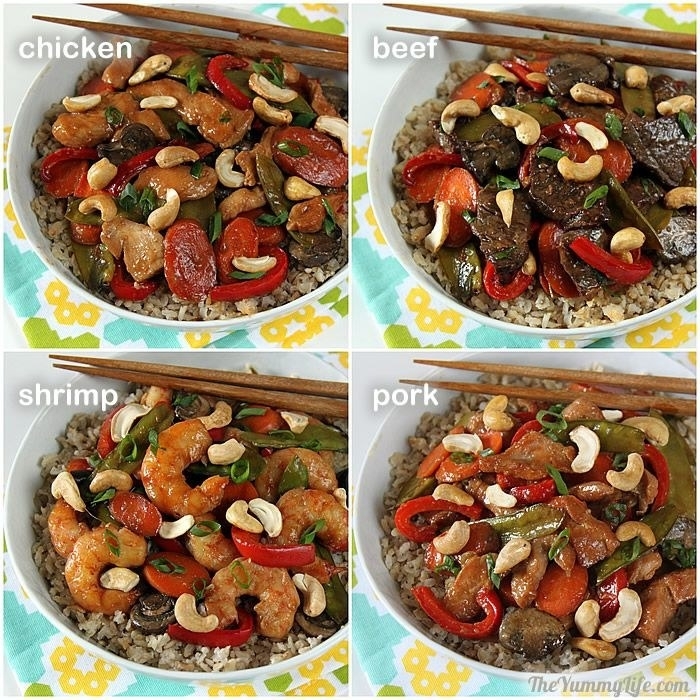 Un-Stir-Fry that you can customize depending on whether you're vegetarian, pescatarian, or an omnivore. 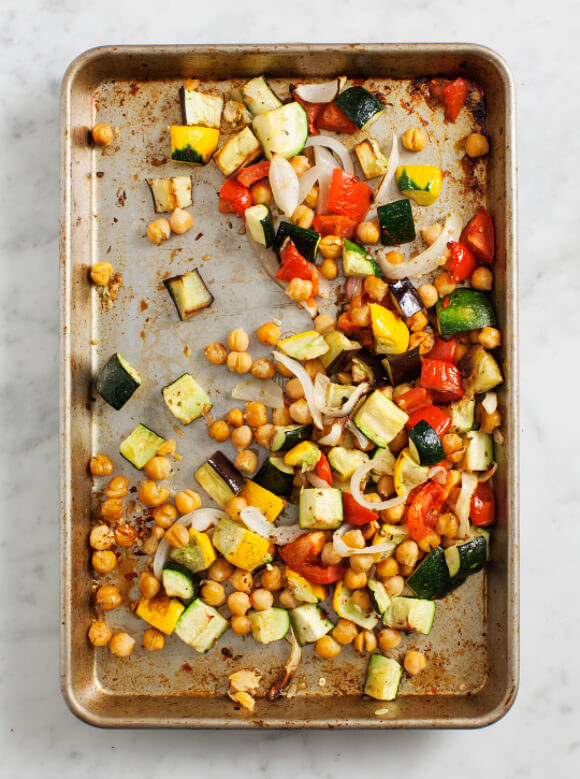 For those Stir Fry-days where you need to just pop dinner in the oven while you run and take care of something else. Get the recipe on The Yummy Life. 17. 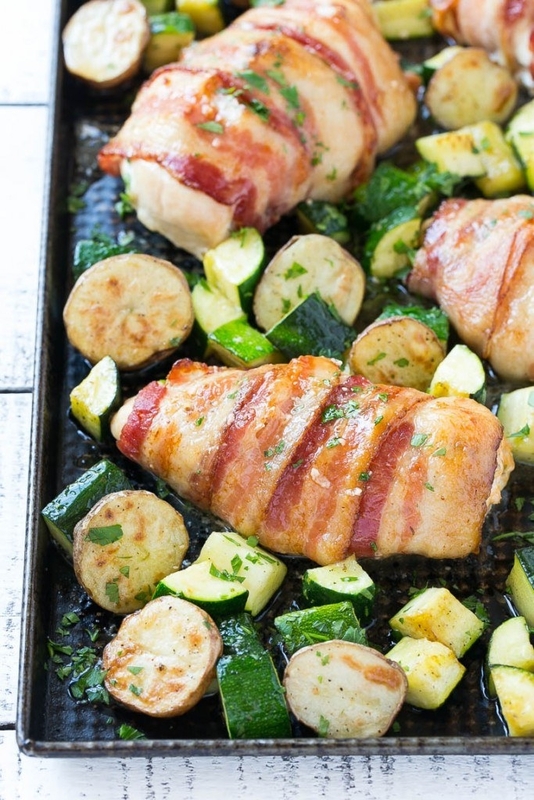 Cheese-stuffed, bacon-wrapped chicken breasts with vegetables that are the stuff of your salty dreams. 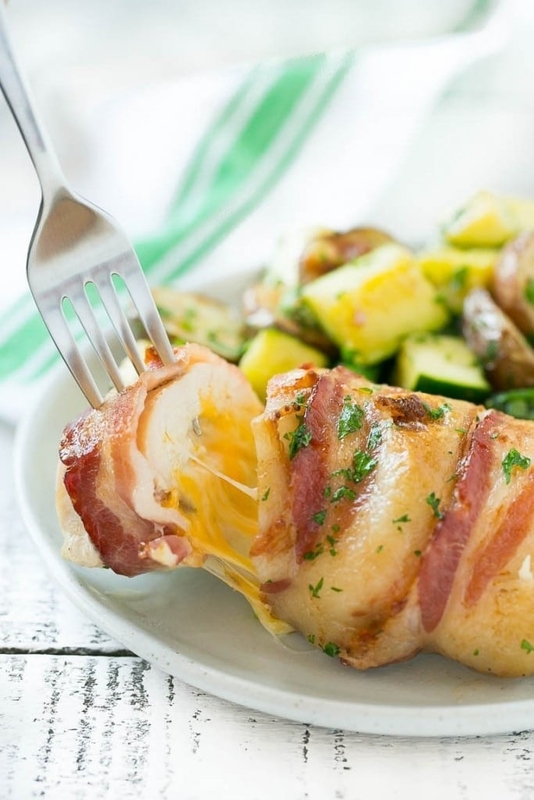 Full disclosure, this recipe does take 40 minutes to cook, but if your stomach is complaining for the extra 10 minutes, remind it how glorious cheese and bacon and chicken taste when they work together. 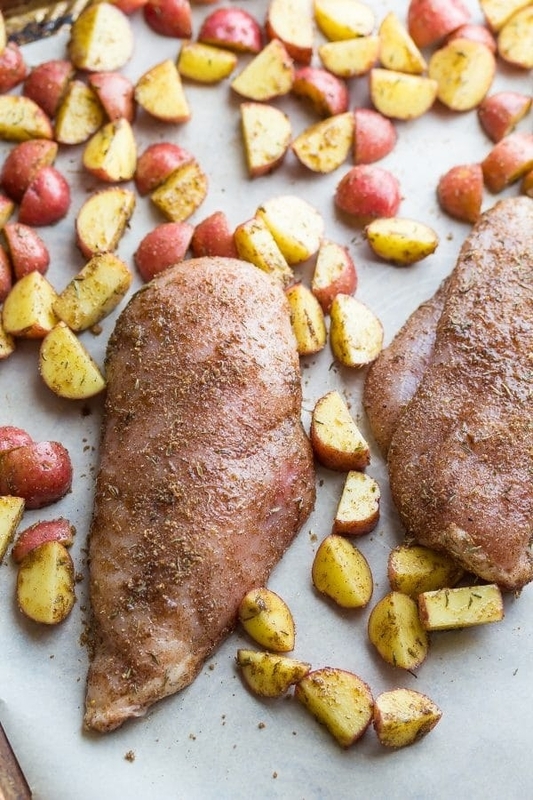 Get the recipe on Dinner at the Zoo. 18. 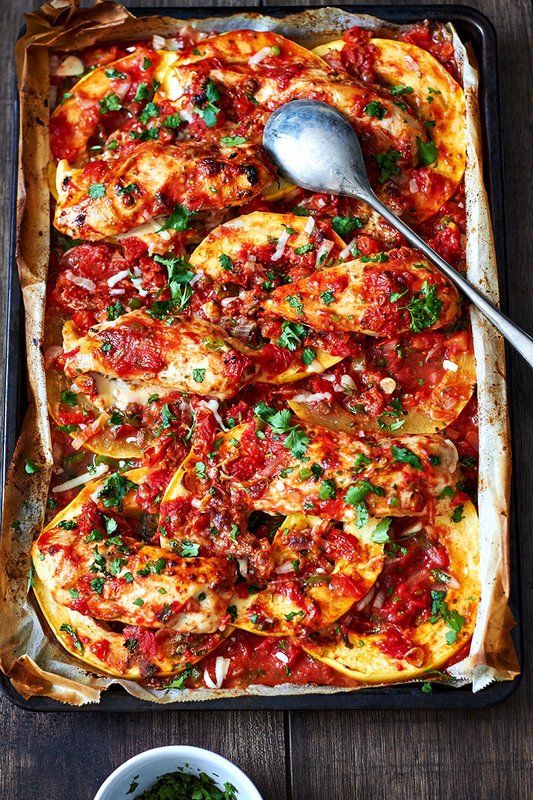 Simple "Ratatouille" perfect for those nights when life's predictable un-predictability leaves you with with almost no time to cook. 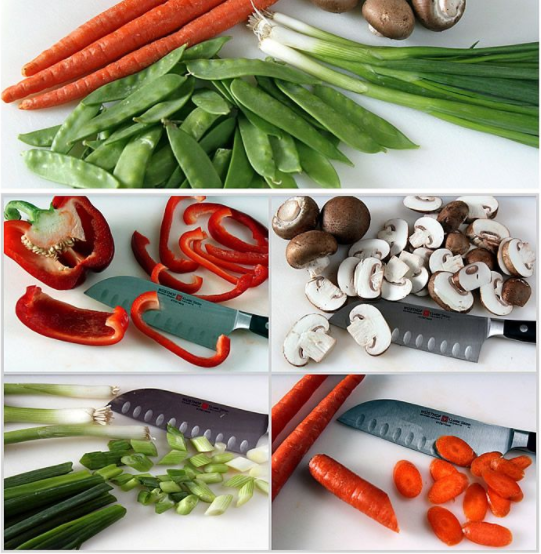 For vegetables that leans more crispy than juicy, modify the recipe and slice them into thin-ish rounds. 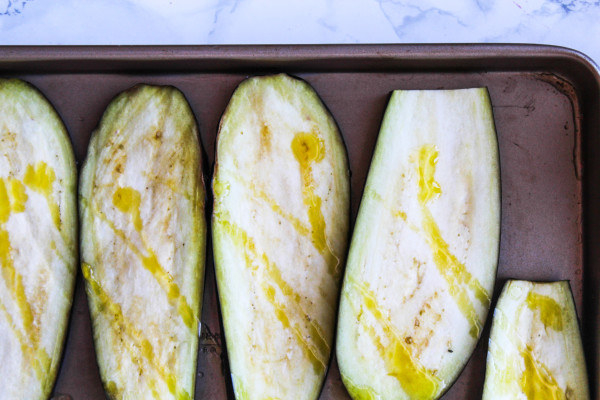 Get the recipe on Love and Lemons. 19. 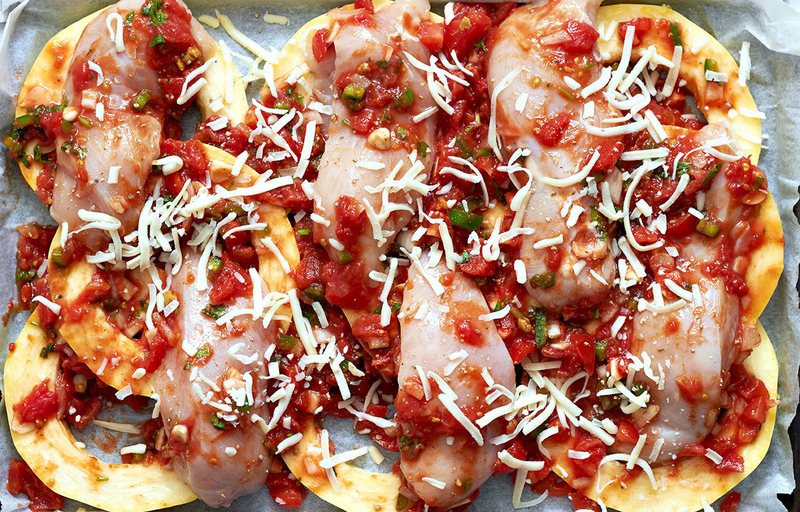 Roasted chicken and spaghetti squash that forms the ideal base to any of your favorite sauces. This recipe calls for tomato sauce, but you could substitute curry simmer sauce, your favorite jarred enchilada or mole sauce, or a couple glugs of ranch dressing. 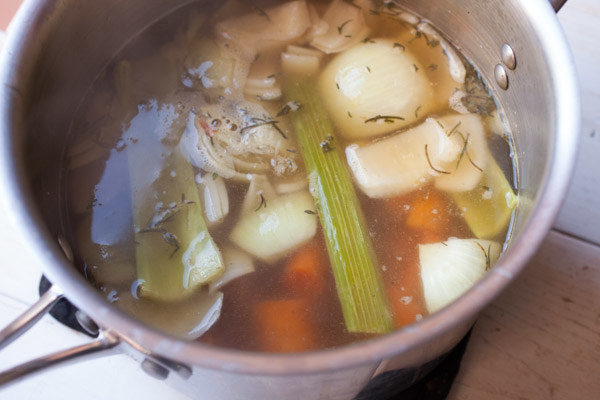 Get the recipe on Eat Well 101. 20. 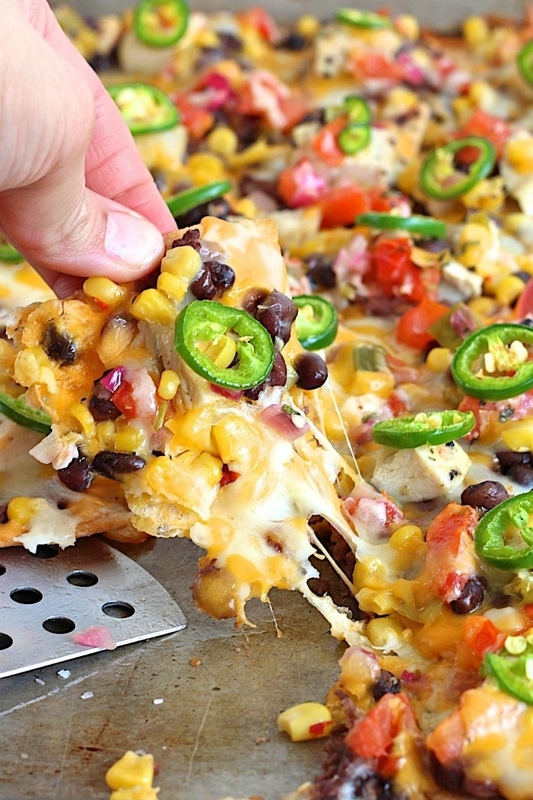 Classic chicken and black bean nachos that you can top with as many or as few jalapeños as you like. Get the recipe on The Baker Mama. 21. 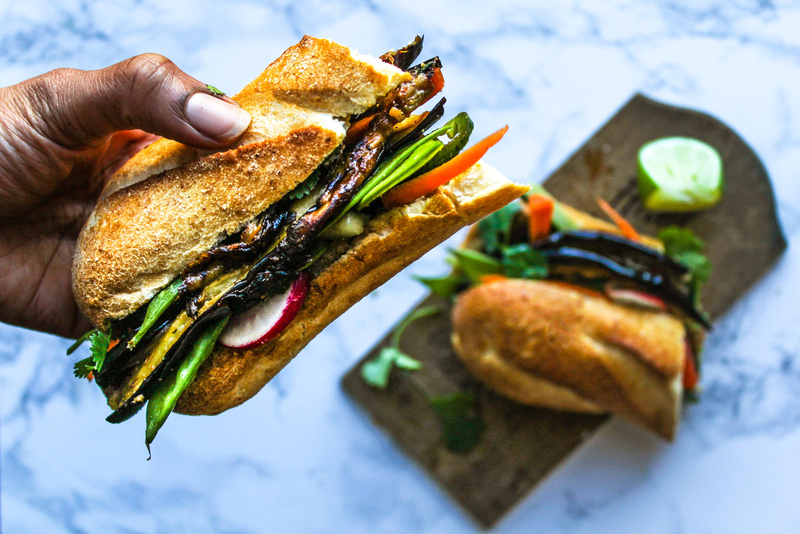 Eggplant Banh-Mi with a blow-your-mind-its-so-flavorful peanut marinade. 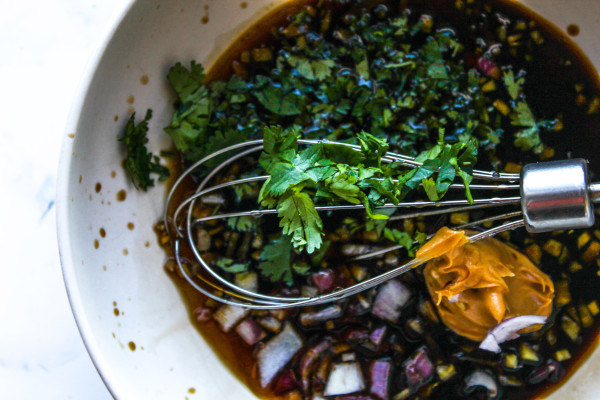 This recipe is *fabulous*, but if you're looking for time and budget shortcuts, you could sub in a store-bought peanut sauce for the marinade, and opt for just carrots, cucumber, and cilantro instead of the multi-veggie combo. Get the recipe on Chocolate for Basil.